Canadian forward Loren Gabel was named the winner of the Patty Kazmaier Memorial Award on Saturday. The award is presented annually by the USA Hockey Foundation to the top player in NCAA Division I women’s hockey. 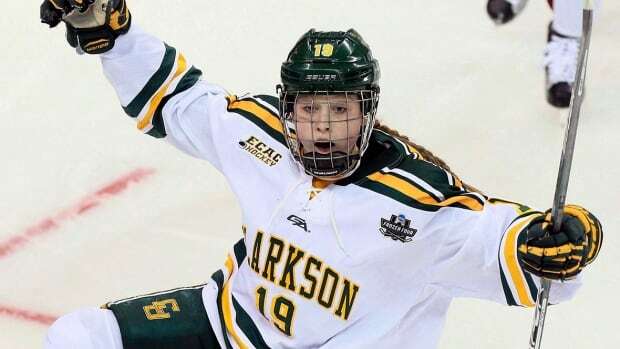 Gabel, from Kitchener, Ont., had 63 points (34 goals, 29 assists) for Clarkson University in her senior season. “I have had the privilege to coach some very elite and talented players during my time at Clarkson, and Loren has proven to be one of the all-time great Golden Knights,” Clarkson head coach Matt Desrosiers said in a news release. American players Megan Keller of Boston College and Annie Pankowski of the University of Wisconsin were also considered for the honour. Gabel was an award finalist last year.